A mod for all final-upgrade buildings that changes the wood to fit with the birch flooring & furniture. 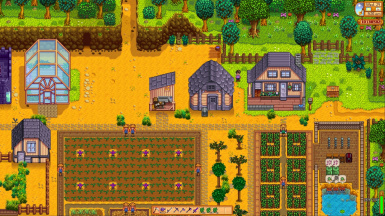 This mod changes the final upgrade version of all farm buildings (except for the slime hutch, greenhouse & totems). Initial unfinished recolors of the first two house upgrades are also available. Starting & big coops & barns not included, deluxe only. Well is not pictured but is included. 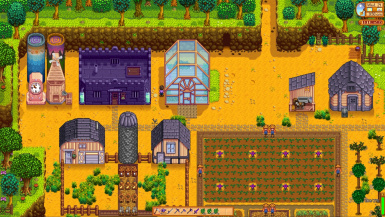 Planned updates will include a better version of the mill and some edits to make the buildings match better in terms of style - basically this was all just color-picker replacement but the barn & coop look drastically different from the style of the house & shed so I'm gonna work on that at some point, and may also change all of the roofs to fit. Installation: Backup your buildings and then replace the .xnb files with the ones in the download!